These last few weeks have been pretty busy with doctors appointments (for my Dad) and a few catering jobs for me. When Monday rolled around I felt I needed to stay home and dig out from what felt like months of paperwork. I was able to toss a bunch of things (doesn’t that always feel good?) and organize the pile that I kept. For the first time in months I was able to see the top of my desk! Woohoo! 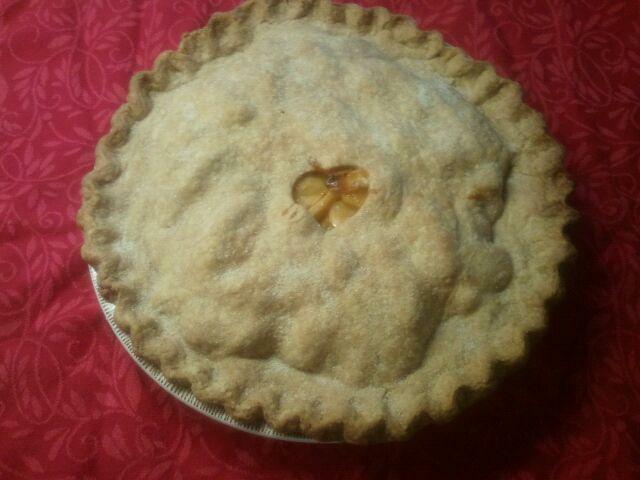 After that amazing (for me) accomplishment, I needed to celebrate by baking a pie. Fortunately, my friend Sue had a birthday this week and that gave me the perfect opportunity to try out a recipe I was given by our mutual friend, Bajr. 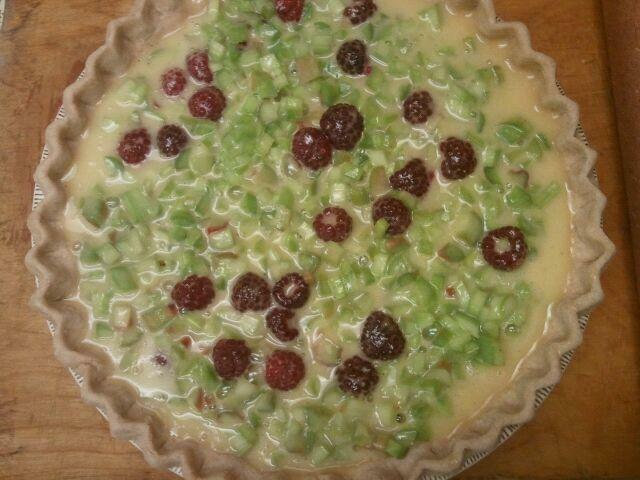 The recipe was for a Rhubarb Custard Pie… and luckily I had the right amount of rhubarb in my fridge (from my neighbor Deb) and just a handful of raspberries to toss in for color. This is what it looked like when it went into the oven. When the pie emerged from the oven an hour or so later, it looked pretty much the same… and it smelled delicious! When it was cool enough to pick up, I drove it over to Sue’s house, but unfortunately she was not at home. 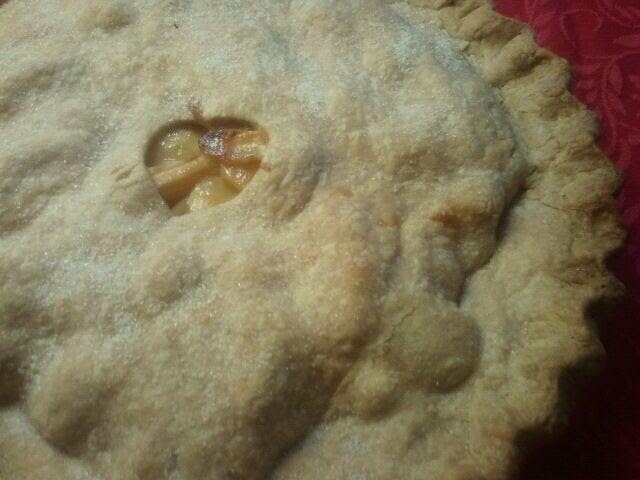 I left the pie in a safe space by her door and sent her a text letting her know that it was home waiting for her. Later, we talked and she told me that she shared the pie with herJefferson Public Radio co-workers and she was delighted to have the original recipe from Bajr. Then yesterday I finally got around to making a pie for a couple who I’d been thinking of for some time. I’ve known Alma and Bill for years and have admired them for many reasons and once had even brought a pie to church for them! That particular day, Alma and Bill were not at church and so instead I went with my intuition and gave the pie to another. That would not happen this time! 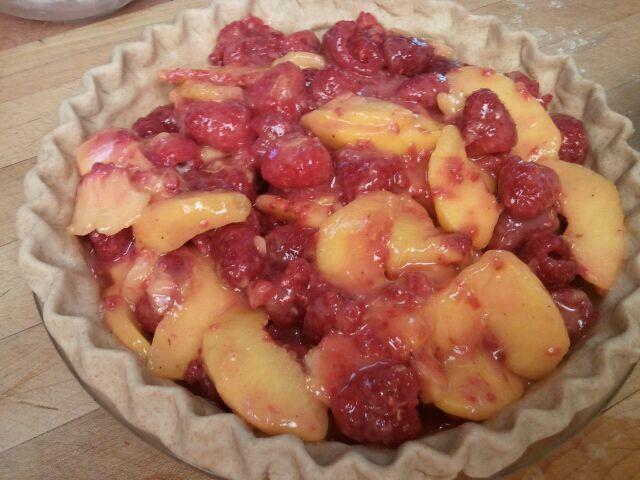 I chose to make them a Raspberry Peach Pie… because the peaches were so fragrant and the berries bright and beautiful. 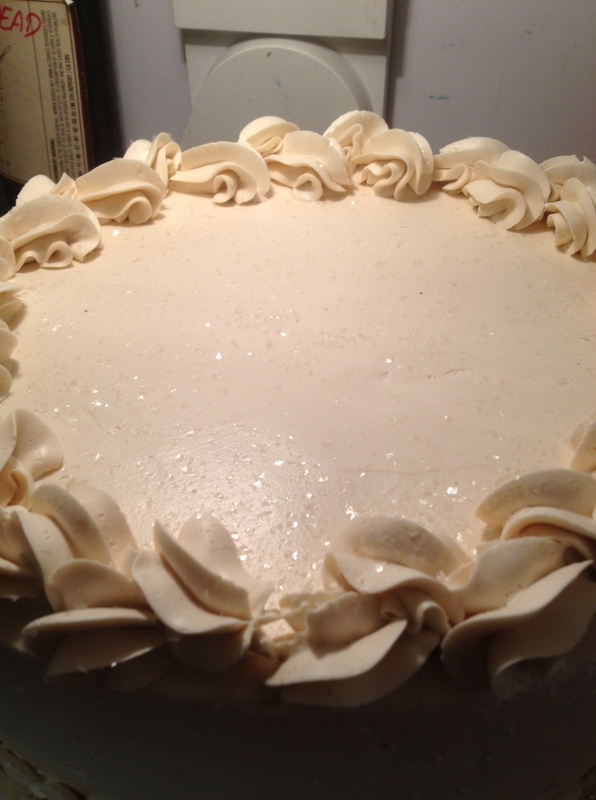 Here is the before baking photo…. lovely isn’t it? Then, I drove the pie to Alma and Bill’s house. As was the case with Sue, they were not at home. I tucked my name into the saran wrap covering the pie and left it on their doorstep. A short while later, I received a lovely call from Alma thanking me for the pie. As I listened to her words I thought, “How lucky I am to be able to make people happy by doing something that I love.” I wish that everyone could discover how good that feels! How can it be so long since I have written? It’s hard to believe how much time has gone by! But to be honest, these past few months have been among the hardest of my life. What that means is that my grand plan to figure out a way to “take care of my Dad” as he was on the road to recovering from his stroke has not been what I envisioned. On the plus side, I have been able to get him some great medical help. I’d heard from many folks that we have good resources here in the Rogue Valley and have found some WONDERFUL health care professionals to assist with his many needs. To begin, I would like to offer my thanks to Dr. John Sager for he has been a tremendous help to us both. Dad has also been fortunate to be able to work with therapists like Brandon and Marilka from Providence Hospital and they have helped him to gain some strength back (and though I did bring them a pie for their kind efforts but have no photo to show!). Lastly, my friend Barb Street has patiently worked to select hearing aids that would help my Dad hear. Like many folks that grew up in the Depression era, my Dad is very careful with his money. For years he has tried to “make-do” with “hand-me-down” hearing aids but they never worked. Last week Dad was fitted with a brand new pair that fit his ears perfectly and he could hear me when I spoke normally (not shouting). It was amazing! That said, I don’t know what to do next. Dad has moved into a senior living environment for a short stay so that I can work on some catering projects but I can tell that he his not happy. And why would he be? His life has changed in so many ways and his daughter seems to be “bossing” him around. Stay tuned as the journey continues…. 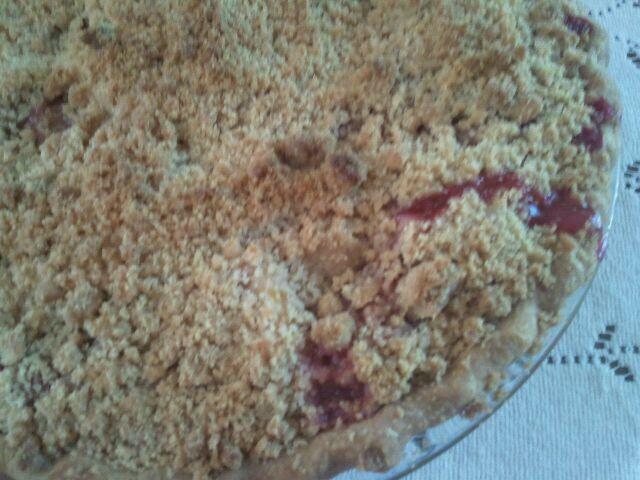 Finally, yesterday I decided to bring a pie to the Sargent family of Buckhorn Springs. This weekend, their daughter Lauren is getting married and I am spending this week helping to cater her wedding. I wanted to thank them for putting their trust in me and allowing me to be a part of this very special time in their lives.